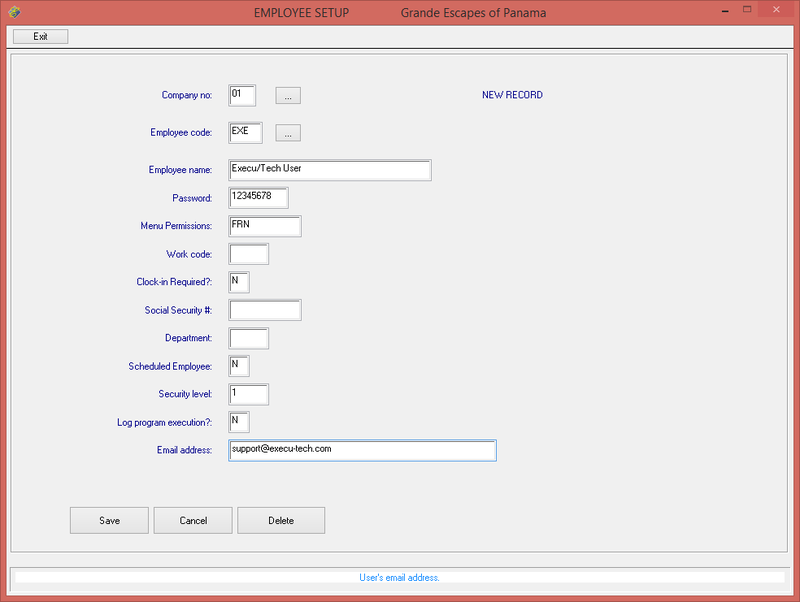 Setting Employee Menu Permissions in this way will restrict the items that the employee will see in the menu. This is a sample of a the default menu configuration file, "MENU.FIL." Yours may be customized and look much different, but the process is the same. When creating the employee I.D. from the System Maintenance menu, use the letters or numbers in the last column, titled, "Menu Permission," to determine the parts of the system to which the employee has access. If you have multiple companies, be sure to give employees who need access to more than one company two asterisks for the company number, and set them up only once. Creating the same employee in more than one company may cause the employee to work incorrectly. In this example, the employee has Front Desk, Reservations and Night Audit , designated by "FRN"
Permissions of a single asterisk ( * ) gives permission to everything. If you use the asterisk, do not give any other permissions to that employee. After assigning employee permissions, you may want to further secure assess to administrative functions by creating Menu Level Passwords.